Lawrence J. Udell, better known nationwide and beyond as “Larry Udell” started helping inventors when his father during the late 40’s and early 50’s invented several household products that Larry put on the market. This biography which we will condense for lack of space will span his more than 50 years of working with and helping inventors to launch their dream product. From Professor of Entrepreneurship teaching at California State University in the mid-80’s to founder or co-founder of more than fifty new ventures over the last half-century. Following is a brief segment of his fascinating life in the big-wide-world of inventions and new technologies. Today, Larry spends his 16/18 hour days lecturing at universities, organizations and federal labs on the subjects of how to turn ideas into commercial products. He focuses on the choices between starting a new company or licensing the technology and the various avenues of opportunities. He works with new venture teams at Stanford, UC Berkeley, UC Davis and other schools in helping the teams recognize and how to research their technology advantages, the market size, the competition, the funding, etc. He also works closely with a great many angel investors and venture capital firms in assisting the decision not only on the strengths and weaknesses of the team members, but how much investment is required and the most logical sources of funding. As he always say’s “I have more fun than anyone I know!” Over the last five plus decades the new ventures have spanned from toys to aerospace technologies and from medical products to electronics. Also in the areas of solar to nano. He tells people right up front, “I am not an expert on anything, I know a little bit about a lot of things, but have over 50 colleagues around the world that are experts from nuclear to space and ocean exploration. His consulting clients have ranged from Mattel Toys to Siemens and from the Governor of Alaska to various federal agencies, including; DOC, DOE, NIST, NSF, USPTO. He created the California Inventors Association in San Francisco in 1956, which produced a major invention exhibition in SF in 1957. Also produced additional invention/new product exhibitions at the California State Fair attracting over a million attendees. Larry has been written up in the Wall Street Journal, Time magazine, New York Times, USA Today, Forbes and others. which is a storehouse of all his published articles and resource center that is free to the viewer. It has offices in downtown San Francisco. Since then he established a very impressive list of Advisory Board members who together are planning on making the CIC the most productive and creative inventor assistance program in America. In 2000 after being a member of; www.les.org since 1982 he created the Silicon Valley Chapter, which today is one of the most successful chapters of 13,000 members in 97 countries. It is the primary source of infor-mation about the big-wide-world of the $150 billion licensing industry. He works closely with many of the top technology companies in the Silicon Valley and beyond, both as an advisor and consultant. He has also established a close working relationship with venture capital firms and angel investors, besides sitting on the boards of companies. Larry started lecturing about inventors and their vital contributions to America and the world’s economy back in the early 1960’s. He is a vibrant exponent on the tremendous value of inventors and how they built this great Nation, and still doing so. A brief review of America’s history shows the earliest inventors and how they, both men and women, made the dramatic positive changes that established the USA as the limitless creative force behind progress for the entire world. He is a proponent of preparing a new invention/product for licensing rather than go into business and find a heavy financial burden on attempting to commercialize their “brain-child”. 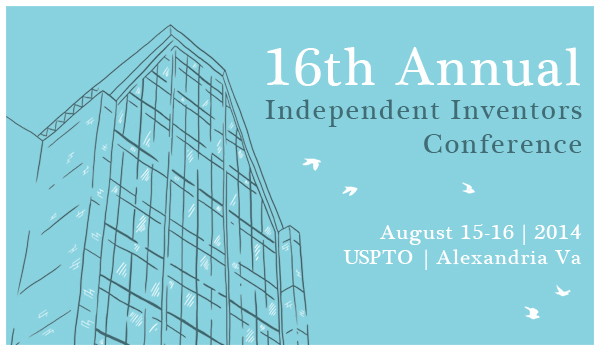 In one of his many lectures he shows the difference, both in preparation and expense in starting a new venture compared to licensing, which he will be presenting at the annual USPTO Inventors Conference on August 15/16 in Alexandria, VA. He points out the various positives and negatives of both, with detailed explanations about those famous inventors he has worked with over the decades and how the decision was made, and why, to pursue either new venture or licensing. As he puts it, “I have had the unique pleasure of working with such illustrious creative individuals as; the famous, Alexander M. Poltorak, founder of AMPEX; Bob Parker, inventor of the Mood Ring and Duracell battery tester; Mark Publicover, inventor of Jump Sport the safety net around trampolines; James Kovach, former 49er, doctor and lawyer on sports injuries technologies; Jim Fergason, the father of (LCD) Liquid Crystal Display with over 130 US patents and 300 foreign patents. Larry was responsible for his induction into the Inventors Hall of Fame and winner of the MIT-Lemelson $500,000 inventor award, which he very graciously donated to various children’s hospitals. Larry also worked with the world-famous Dr. Forrest Bird who has been honored by both President Bush and President Obama for his respirator in every hospital in the world and the countless infant lives that have been saved. Dr. Bird also happens to be the oldest licensed helicopter pilot in the world at 93. Then there is Curtis Landi, inventor of flexible honeycomb with over 120 US patents. His products are used in the new Boeing Dreamliner, hospitals, hotels and numerous other uses. Then you have Martin Cooper, inventor of the cell phone and Don Evans who began his inventor career on the kitchen table when he got out of the Navy in 1945 and created a world-wide billion dollar (privately owned) corporation that manufactures injection molded products from artificial finger nails to hypodermic needles. Larry spoke about the time he met the famous Henry J. Kaiser, one of America’s great industrialist who helped win the second world war with his hundreds of Liberty Ships, his automobiles and his famous Kaiser Permanente Hospitals providing health care to millions of patients. He was at Kaiser World Headquarters in Oakland California presenting an inventor who built, by hand, a micrometer that measured to one-millionth of an inch, long before electronics and computers. Then I asked if he had ever met Steve Jobs? His reaction was “Yes” since he attended Steve’s 30th birthday party in Los Angeles that was hosted by their mutual friend Arthur Lipper, publisher of Venture magazine. Larry said he rode down the elevator with Steve and will never forget that he had on a white shirt and tie and they spoke about the future and creativity. They followed up briefly over the next few years, but as he puts it, I should have maintained a closer relationship since we both were following a path of invention. He went on to express his opinion about inventors and inventing. He said that inventors are the backbone of America since it is one of only a few ways to become independently wealthy today, unless you win the lottery or have a rich relative that lists you in their will. If you walk the aisles of any major retailer, you will see new products today that were not there last week. Over 28,000 new products are introduced every year to American consumers. Not necessarily inventions turned into products, but lots of improvements on existing products, however if you watch closely and devote some time to the internet you will easily see some great new inventions transformed into new products. One of the biggest obstacles facing an inventor is the sales and marketing. Even if you make “Them” in your garage, where and how do you introduce them to the market? The shelves are full and if you are going to compete with established companies you are going to have to pay for quality shelf space, besides finance the production and if they don’t sell be obligated to take them back. And, in many cases not getting paid for three or four months after delivery. Can an individual inventor finance this? Almost always the answer is “no” so they go out looking for money, called investment capital. I continually preach that when you are seeking funding, be very careful who you take it from. If it is friends and family, you may wind up never being invited to Thanksgiving again. Only if Grandma loves you and can afford to lose the money as an investment it may be alright, but not as a loan, which means you have to sign over certain personal assets as collateral. You always have the (SBA) Small Business Administration which has a budget of about two billion a year that guarantees the funds to the bank. It can be complicated so be careful. I constantly hear inventors say they will get venture capital to fund their idea. Big laugh, since VC’s will not even talk to you without credentials or a referral, and in most cases not interested unless you can justify at least a $5 million dollar investment. Investment means they are buying equity in your corporation, not in you as an individual. Besides if you are a one person company, they will want to see a team comprised of not only previously successful entrepreneurs or team members with credentials like Ph.D. or M.D. or? When I traveled to foreign countries for WIPO (United Nations) and lectured on creating economic diversity I was constantly barraged by inventors who pleaded with me to take their idea back to America and make them rich. They thought that ours was the land of opportunity. It is, but remember you create them they are not handed to you. I personally, as long as I have breath and perseverance will continue to help the inventors of the world, but it has to start with you helping yourself first to make sure you are prepared for success and/or failure. The one thing we have today, that did not exist in most of my 83 years, was computers and the internet. With the limitless boundaries at your fingertips there is no excuse for not being properly prepared. Do your very extensive research on competitive products, markets, distribution and all of the other obvious ingredients to turn your idea into a winning product. 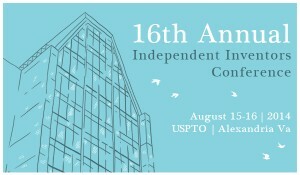 The conference will be held August 15-16, 2014. Inventors can now use Crowdfunding to raise investment or to test the market for their new product idea.